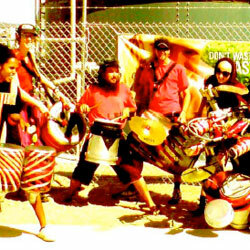 Since 2002, the Junkadelic Collective has been taking Funk on Junk all over Western Australia and across the seas to Hong Kong. By re-envisaging ‘Junk’ as a resource for making instruments and applying it in a form of ‘Edu-tainment’, we break away from wasteful trends and help others to see that they are capable of doing their own thing in unison with others. Showing what is possible with a little imagination and a little effort. The Junkadelic approaches this with a holistic view seeking to connect rhythm in your body to your mind and being enterprising with what we have and what we find. Inspired by Mardi Gras/Calypso festivals and a myriad of musical forms Junkadelic remains a vibrant part of the DIY culture that has, and always will be, the birthplace of fresh ideas that paves the way towards sustainable living. And we'll have a good time while we're at it. 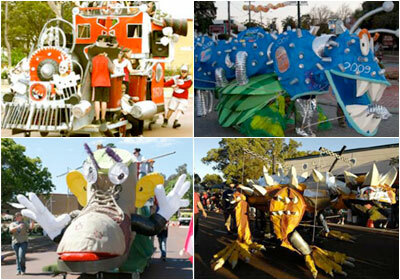 Junkadelic draws on the dominant influence of funk and hip-hop on today's popular music, combining this with the more traditional elements of the New Orleans Mardi Gras (which known as the ‘birthplace of funk’), as well as the local environmental movement toward recycling and young people expressing themselves in the streets. The Origin: The New Orleans Second Line percussion (and brass) bands are at the foundation of funk and rock music from North America. The second line of a New Orleans parade is derived from the group of colourful revelers who dance, strut & follow behind and alongside the ‘official’ band and mourners in the ubiquitous New Orleans funeral procession. Beginning with a slow funeral dirge, to the cemetery, once the deceased has been put into the ground – the beat turns up tempo and the parade becomes a celebration of life. The percussion, costume and dancing in the second line is all improvised, however it is also all ‘within the groove’. The Workshops: Within a Junkadelic workshop the participants are shown what makes up a typical Second Line parade beat – and shown simple ‘clave’ rhythms which they can use as tools to improvise within the Second Line beat. The participants are also shown how to make simple junk percussion and wind (reed horn) instruments and through body percussion, shown what to look for in an ensemble of junk. After a series of jam sessions the participants soon catch on to the groove and are able to jam with the Junkadelic core group. We also teach participants simple secondline dance / strut moves – so they can really get into the groove while participating in the performance. With further workshop sessions, the participants are taken on a journey through the history of contemporary music, from New Orleans Mardi Gras – to James Brown rhythms – Calypso – Reggae – Samba – Afro Cuban and Hip-Hop beats. 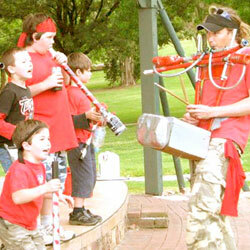 Junkadelic has had a vast experience working with young people and children in both urban and country areas. 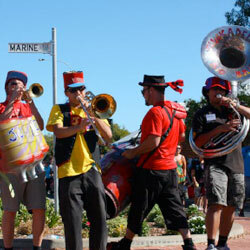 Junkadelic has performed regularly at many local Western Australian Festivals including PIAF, the Fremantle Festival, Joondalup Festival, Leederville Festival, Zig-zag Festival, Fairbridge Festival, and at many more local community Festivals and schools. 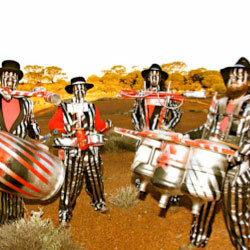 We have also performed and worked with remote communities in Wyndham, Carnarvon, Cue, Jigalong, Parngurr, Coolgardie, the eastern wheat belt, and all over the South west including Southbound Music Festival, Augusta River Festival, Esperance Festival of the Wind, ‘Gascoyne in May’ Festivals and the Busselton Beach Festival. Most of these remote projects involved living with and working with the local communities for anything from a few to a couple of weeks. 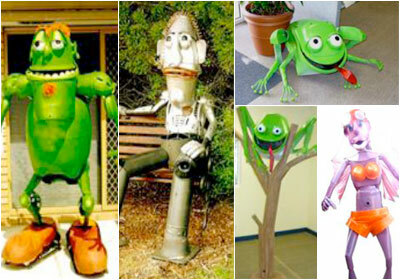 On these projects the participants make everything from instruments, puppets, floats, sculptures to costumes and learn rhythms and vocal chants which lead up to a showcase performance for the local community. Junkadelic Performance Options – something for everyone! 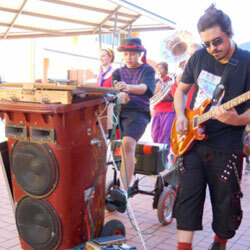 Junkadelic Pure Junk – Consisting of 100% pure junk – Junkadelic performs with handmade instruments constructed of materials from your local tip – or from the side of the road. This semi-tuned performance is as quirky as it is funky. 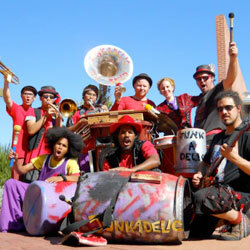 Junkadelic Brass Band – Consisting of Junkadelic percussion section backed by a brass band ensemble consisting of Sousaphone (tuba), Trombone, Trumpet and saxophone. Funky Street Jazz performance! Ultimate Junkadelic Big Band – Consisting of Junkadelic percussion section backed by the brass band, amplified Bass, Guitar, vocals and dancers. Can be performed as a mind blowing stage show with full production – or roving through the streets powered by the wheely bin sound system. Wheely Bin Sound System – This is a solar charged PA system mounted into a wheely bin, fixed to a mobile electric buggy. It's the ultimate sound system for the roving street performer! Junkadelic Facilitators plus the band in each session. We can tailor any proposal to suit your specific needs or requirements. You can contact Ken Allen at the Funk Factory on 0439 452 293.